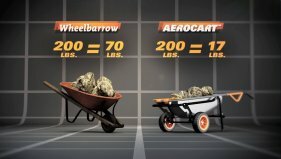 As you know that wheelbarrow is an important element tool for gardening, let us discuss some considerations to buy wheelbarrow. There are different types of wheelbarrow in market. It is very crucial to choose a right that perfectly fulfill your demand. I have discussed the following key considerations to buy wheelbarrow. Let’s start. 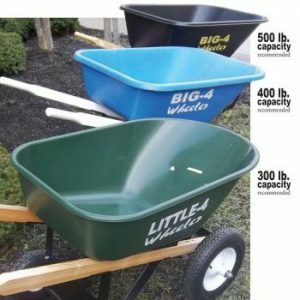 The tub area/capacity of wheelbarrows varies from one product to another. Thus, if you are looking for a wheelbarrow to load and move large objects, it is always ideal to opt for one that has a larger tub area/capacity. Some wheel barrows have a larger capacity than others of its kind. Thus, before purchasing a wheelbarrow, assess it first if its capacity fits your primary purpose of using the wheelbarrow. Some wheelbarrow has an excellent center of gravity that reduces load for you. By using these type of wheelbarrow, you can save your back. In choosing a wheelbarrow, it is important that it is convenient and hassle-free to assemble. Thus, before purchasing a wheel barrow, it is wiser to know beforehand if it is easy to join so that you can save a lot of effort and time in the process. Some wheelbarrow need additional person to assemble it. While some other wheelbarrows do not need help of others. For assemble, manufacturer my send/ship a printed document along with wheelbarrow. Additionally, you can always download a PDF assembling file from manufacturer web site. Wheelbarrows tend to be big and bulky to store, and this can be a problem to users with little space left in the household. However, some of those have easy-to-store features because it can be foldable or convertible. Thus, before purchasing a wheelbarrow, it is better to assess first if it has this kind of easy storage features. Some wheelbarrows have a multi-functional facility. This means that the wheelbarrow is not just good for wheelbarrow use, but has better loading and moving features such as a potted plant mover or a cylinder holder. In choosing a wheel barrow, keep an eye if it has a multi-functional facility, to make the whole purchase worth the price. In buying a wheelbarrow, it is important if you assess first on where you will primarily use it. Are you going to use it for home, agricultural, commercial or for contracting use? 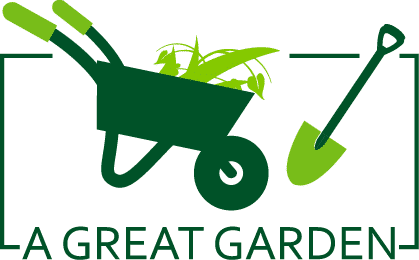 With the wide array of wheelbarrows available in the market, it is important to choose the best garden wheelbarrow that will perfectly suit your use. For example, if you are looking for a garden wheelbarrow, then marathon wheelbarrow is perfect for you. 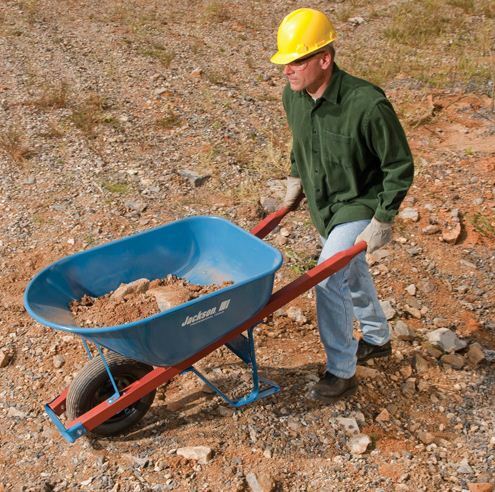 If you need heavy duty, contractor grade wheelbarrow then Jackson wheelbarrow would be right choice for you. The tub of a wheelbarrow is usually made of steel or plastic/poly. Mostly, steel tubs are more durable than plastic/poly tubs. However, there are also plastic/poly tubs that are strong but limited to home use. Thus, it is a must to check if the tub is well-made and of the highest quality since it is where you will place your loads. Wheelbarrows can be one-wheeled, two-wheeled, three-wheeled or four-wheeled. Mostly, wheelbarrows with four wheels provide a better load stability, but are hard to maneuver in narrow areas and corners. On the other hand, some wheelbarrows might have lesser wheels but supported with braces to provide the same stability as a four-wheel wheelbarrow, and can be easily maneuvered around narrow areas and concerns. 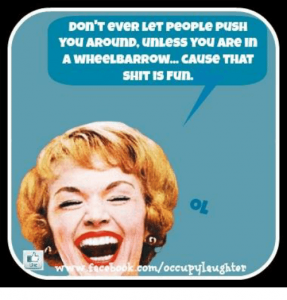 Thus, it is important to consider the wheelbarrow’s wheels especially on where you intend to use it mostly. Wheelbarrows can have pneumatic or airless tires. 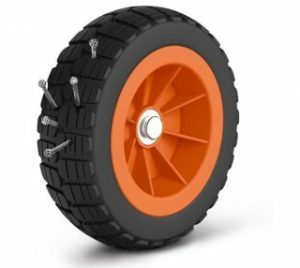 Pneumatic tires require regular inflation, while airless tires do not need regular inflation and require less to no maintenance. Thus, it would be ideal if the wheelbarrow you intend to purchase has airless tires. Since the handle is the steering wheel of a wheelbarrow, it is important that it provides an easy wheelbarrow move, and you can comfortably grip on it. 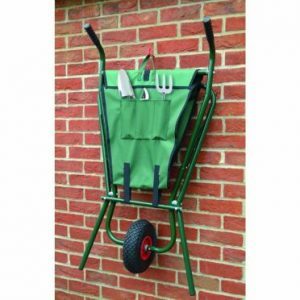 It would be ideal if the handle of the wheelbarrow you intend to purchase has a cushioned grip handle for you to handle the wheelbarrow comfortably. Some wheelbarrow may have cushioned grip handle, while some others have polished wooden handle. You can a details post on wheelbarrow handles. It is important that the wheelbarrow you are going to purchase is user-friendly. Make sure that the wheelbarrow is fit for your use, and its size is perfect for your height to avoid back aches. In addition, it is important that no matter how heavy the load is inside the tub, you can still effortlessly move the wheelbarrow. It is better if you like the color of your wheelbarrow, right? 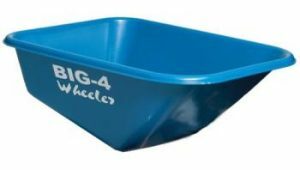 Psychologically, a wheelbarrow that has an attractive color will motivate you during loading and move jobs. Thus, it would be better if the wheelbarrow you are going to purchase is available in different attractive colors, or if possible, available in the favorite color you want. If you are going to use the wheelbarrow on unpaved roads, check if the clearance or gap between the base of the tub and the ground is sufficient enough to avoid scratching the wheelbarrow’s tub and causing further damage. Wheelbarrows tend to be quite expensive. Thus, it is important to check if the price of the wheelbarrow is just right for the features it has. 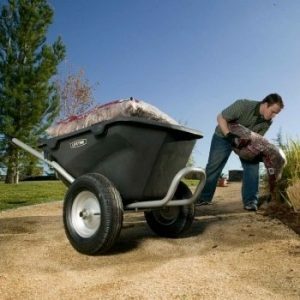 If you are looking for some cheap wheelbarrow to buy, click here. I have discussed all the major criteria to buy wheelbarrow. I hope that you have got some idea about wheelbarrow. Additionally, read this article to get detailed information on top 05 wheelbarrows. You can easily select the best wheelbarrow from that list. LEDs vs T5 Fluorescent Grow Light – Which is better? Why Should You Spend Time In The Garden?